Brand new Guild Wars 2 Gems cards are available on Mmosale! 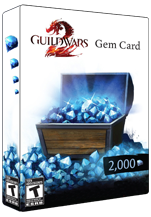 Buy a card now, you will get 2000 Guild Wars 2 Gems. The Guild Wars 2 Gems are used to buy some special items in Gems Store, also they can be exchanged to Guild Wars 2 Gold. Various items including many helpful additions are only purchasable with GW2 Gems. Yet these items will definitely worth your gems. Once you get a Guild Wars 2 Gems Card, you can redeem your code in the Black Lion Trading Company panel. Gems will be delivered automatically as soon as the code is redeemed. Our Guild Wars 2 Gems Cards are of the cheapest price and will be delivered in the fastest speed. The card will be sent to you via e-mail in scanned version when your order is confirmed.